The locals say that when God created the world, before he lay down to rest at the end of the sixth day, he collected all the natural wonders he had not yet used and threw them over the Andes. They fell to earth to form Chile. From east to west the average journey is only 180km but north to south you must travel over 4,000km through salt desert and rainforests, over mountains and snow-capped volcanos, lakes, high plains and glaciers. Santiago de Chile, cosseted in a natural amphitheatre formed by the Andes, lies roughly in the centre of the country and is a focal point for travel. In itself it is a modern city typically afflicted with pollution problems, but here are some fine old buildings, pretty parks, impressive art collections and a magnificent pre-Colombian museum. For colour, the Paso Ahumada is buzzing with buskers and vendors, and for crafts visit the fair at Bellavista. A short journey west from Santiago brings you to the Maipo Valley, Chile’s premier wine region. Chilean wine gets better and better and the vineyards are worth a visit. 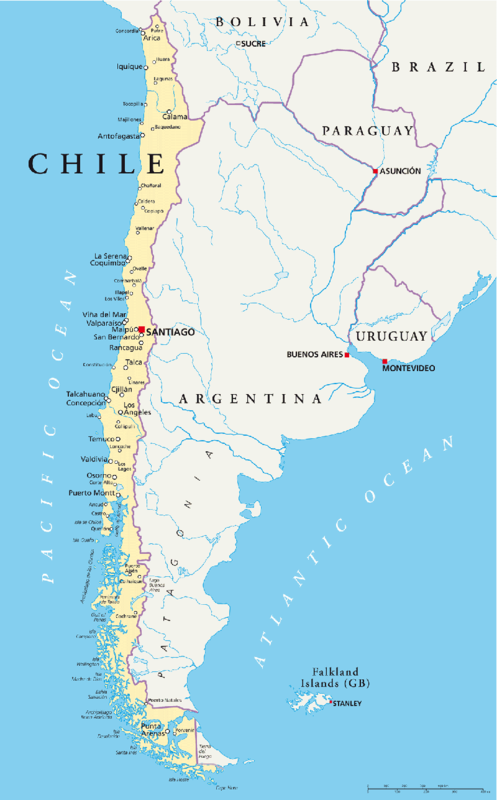 Further west, on the coast, lies Chile’s principal port, Valparaiso, and neighbouring beach resort of Vina del Mar. In Valparasio, Chile’s second largest city, you will find winding cobbled streets, stairway footpaths, fine museums and a lively market at Muelle Prat, while Vina del Mar has good beaches, excellent Pacific-fresh seafood and the national botanical garden – all worth seeing. In the north of Chile lies, reputedly, the driest place on earth, the Atacama Desert; harsh and serenely beautiful. Around San Pedro de Atacama are rock carvings that are testament to this area once being fertile, and the unearthly geysers that sporadically shoot steaming water into the air. The most striking terrain of all, across the great salt lake of Salar de Atacama is the Valle de la Luna; the name says it all. In complete contrast to the deserts of the north is the Chilean Lake District in the mid-south. As in Argentina, this Lake District is for those looking for beautiful scenery and outdoor water and land-based pursuits. Once home to the feared Mapuche Indians, then to German settlers, this is a landscape of mountains, lakes, waterfalls and the rich forest of the Puyechue National Park. Puerto Montt, the region’s main city, exhibits evidence of its Germanic heritage in architecture and language and is also a staging post for boat journeys leaving for the south. Immediately offshore, lies densely forested Chiloe, an island of myths and legends, today noted more for its friendly people, enchanting villages and 150 wooden churches. South from Puerto Montt lies Chilean Patagonia, notably a dramatic coastline of inlets, fjords and islands behind which tower the Andes. The further south you go the more inhospitable it becomes, pass spectacular terrain with the likes of the San Rafael Glacier flowing right down to the sea and a population of coastal and marine wildlife. Boat journeys are available sailing down to Tierra del Fuego, where you can explore the Strait of Magellan, and even beyond, to Antarctica. Inland, however, is the most magnificent national park in Patagonia, the Torres del Paine, a world biosphere reserve with scenery of icy pinnacles of rock stretching to the sky, the majestic glaciers and the unreal, aqua marine coloured glacial lakes. It is great for outdoor adventuring and absorbing views.